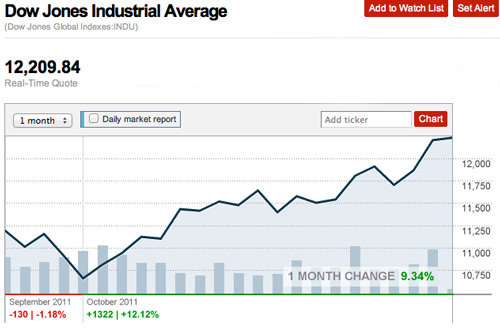 From ThinkProgress: Despite conservatives’ claims that the rhetoric used by President Obama and the 99 Percent Movement is hurting the economy, the stock market is on track to have one of its best months in history. The Dow had added about 1200 points this month by the closing bell yesterday, which would be the biggest point gain in the index’s history. The S&P 500 also had its biggest point gain in history this month. Measured by percentage, both indices are on track for their best month since 1987. Are you paying attention Wall Street? Seniors - are you seeing your retirement accounts go up?